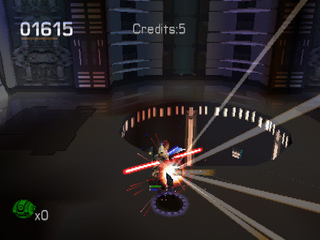 PSX Star Wars Episode I: Jedi Power Battles (USA) in 46:31.18 by DarkKobold. Jedi Power Battles is Star Wars meets Double Dragon with a ton of crazy platforming. The author, DarkKobold, uses Obi-Wan to run through all of Star Wars Episode I, ignoring tons of battle droids and droidekas to get to the final confrontation with Darth Maul. Look for a tribute to SW: EP1 in the final battle! The author also dies intentionally at one point in the run by making Jar Jar Binks disappear. I'm sure everyone has wished they could do this, at least once.